Well, I’m still too sick to attend any bandings, alas! But, I do have the skinny on both from Mary. Ean (F, b/r 03/E): This was the name the Celtic Knot submitted. It is the Gaelic name for “bird” – appropriate since Ean is, indeed, a bird! Deborah (F, b/r 04/E): Named for Deborah Cohen, dedicated caretaker of several generations of the Evanston peregrines and watcher of the Loyola peregrines. I thought this was great, since Deborah has been such a great help and is a really delightful person. Mary told me she got choked up when they named her bird. I wish I’d been there! Aldo (M, b/r 11/D): For Aldo Leopold, an American ecologist, forester, and environmentalist. He was influential in the development of modern environmental ethics and in the movement for wilderness preservation. 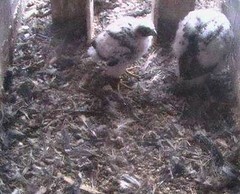 So, let’s see, the score now stands: females (9), males (4)! ~ by Steph on May 27, 2009.